The death of Joseph Stalin in 1953 began a period of “de-Stalinization,” initiated by Nikita Khrushchev. Just as the architecture of the Moscow metro serves as a physical demonstration of Stalin’s vision of the Soviet Union during his reign, so too does it reflect the changing times aft er 1953. In previous installments of the Notes from Underground series we have seen a parallel progression: As Stalin’s chokehold on the Soviet Union tightened and his reach extended to all branches of the arts, initially simple and derivative stations evolved into high “Novsovroc” (New Soviet Rococo) explosions like Komsomolskaya on the Circle Line (opened January 30, 1951) and Arbatskaya on the Dark Blue Line (opened April 5, 1953). 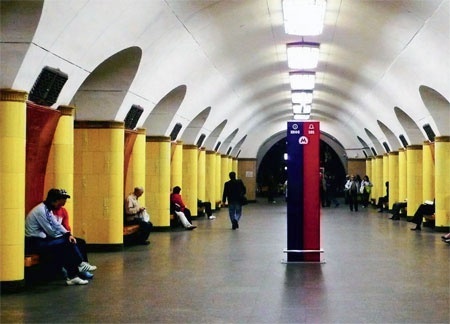 In this article, we will look at the changes that Stalin’s death wrought on the Moscow metro. Stations completed after 1953 reflect an esthetic sea change within the Soviet Union and demonstrate the more practical, utilitarian vision of Khrushchev, who would alter forever the way the Soviet Union looked and bring to an end many of the excesses of Stalinist culture, from bloody purges to florid architecture. Following Stalin’s death, the Communist Party led by Khrushchev acted relatively quickly to tone down or cancel expensive and wasteful projects. The November 1954 Decree on the Liquidation of Excesses estimated that Stalinist projects spent about a third of their total cost on unnecessary decoration and extravagance. 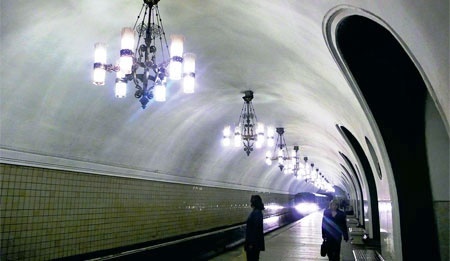 Architect Alexei Dushkin, previously celebrated for designing the Mayakovskaya and Avtozavodskaya metro stations, was condemned for his cost overages and extravagance. While this by no means signaled a full stop to Soviet excesses in architecture or to Socialist Realism, which would remain a powerful influence for decades to come, it did sound the death knell for the bloated neoclassicism of the late Stalin era. The last of the stations designed under Stalin — including VDNKh, Alekseyevskaya, Rizhskaya, and Prospekt Mira on the Orange Line — were opened on May 1, 1958, a date that marks the end of the Stalinist projects in the Moscow metro. An examination of two of these stations, VDNKh and Rizhskaya, reveals how Stalin’s legacy was muted first and then discarded completely. VDNKh, the station which was to serve the Exhibition of Achievements of the People’s Economy, was destined to be heavily decorated much like Arbatskaya on the Dark Blue Line, and there are other visible basic design similarities between the two stations. However, many of the planned decorative details were eliminated aft er Stalin’s death, including mosaics by the artist V.A. Favorskoy, which were replaced by green paint. The chandeliers appear to be more subtle echoes of Arbatskaya’s excesses, as are the decorative grilles covering the ventilation shaft s. The above-ground rotunda is a clear survivor of earlier concepts but also stripped of much of the excesses of the early 1950s. The station is still harmonious, however, and does not seem like a compromise. In fact, the relative subtlety of décor allows one to linger over the geometry of the station itself. Rizhskaya, named for the nearby railway station from which trains depart for the Latvian capital of Riga, is also an example of the new modesty in architecture that emerged under Khrushchev. Designed by Latvian architects, there is no marble on the walls here but a more modest facing of brightly colored Latvian ceramics on the pylons instead. The yellow-and-brown color scheme has led some to refer to the station as “Bacon and Eggs.” The brown portions of the pylons are cut with simple reliefs showing architecture and scenes of Riga. These are so subtle that they can be easily missed by the casual observer. The ventilation covers and the edges of the wooden benches, as well as the pylon cornices, are ornamented in the national Latvian style. The shift to more subtlety, as well as less expensive materials, is clear in these two stations. Shortly after the opening of these stations in 1958, metro construction entered what is oft en called its sorokonozhka, or centipede, phase, named for the rows of identical concrete columns that were a key feature of stations built during this period. Stations along the Orange Line going northward from the center offer good examples of this simpler, standardized design, which was adopted in the early 1960s and signals a dramatic shift from one extreme to another, from overwrought bombast to rapid, cheap expansionism and dull utilitarianism. While some of the stations built during this period retain the marble and decoration of an earlier design era, many of the stations built during this time differ only in the color of their ceramic bathroom- style tile. Often, the lack of respect given to their construction is reflected in the neglect of their upkeep. The mid to late 1970s saw new, innovative station designs begin to nudge the bland centipedes aside, and by the 1980s the Moscow metro was experiencing a rebirth of sorts, adopting new motifs and entering into an era of construction that I refer to as “Space Communism,” with many of the stations featuring sleek space-age details or references to scientific achievement. One excellent example from this modern era is Mendeleyevskaya, opened on December 31, 1988. This station’s neoclassical marble floor and walls clad in cloud-white Ural marble seem to hearken back to the Stalinist era. A bas-relief of the 19th-century Russian chemist Dmitri Mendeleev anchors the southern, blind end of the station, while abstract circular panels depicting ostillograms line the tunnel walls near the center. The main focal element of the space, however, is a series of chandeliers in the shape of atoms. The creator of the periodic table, Mendeleev was the first to understand that all of the elements are part of an ordered scheme, and the station is a tribute to this achievement. Next month, we move to the modern era of the Moscow metro, focusing on stations constructed after the collapse of the Soviet Union and on current plans for expansion of the system.